Almost any sewing machine you find today—aside from an industrial sewing machine or extremely old machine—will have a straight stitch and a zigzag stitch available. They're essential stitches that you will use the most for your sewing projects. As you become familiar with your machine, it's important to understand how to make adjustments to these stitches and the effects these changes will have on your sewing. For both types of stitches, you should be able to adjust both the stitch length and the stitch width, but they affect each stitch in different ways. The straight stitch is your basic utility stitch that will be used for most construction. This stitch is best for sewing seams unless you need a stretchier stitch. When sewing with a straight stitch, the most common adjustment will be adjusting the stitch length. This can eliminate puckered seams and the overall stitch appearance. Setting the stitch length to the absolute minimum will allow you to sew a lock stitch. A lock-stitch is one way to anchor the stitching without adding back-stitching to what you are sewing. You can also adjust the stitch width. This is a "straight" stitch, so it doesn't actually affect the width because it will always create a straight line. Instead, the width setting will change the needle position. This allows you to use various guides on your sewing machine and give you the most control over where your stitching is landing. The majority of sewing machines allow you to adjust the needle position to be left, right, or center. Some machines allow you to set stitch width in smaller intervals. The more adjustments that are available, the more control you will have over stitch placement. For example, changing the interval can create a tapered line of stitching. To achieve a smooth stitch appearance, you may also need to adjust the tension on your sewing machine. A straight stitch will not stretch, even if you're sewing a piece of stretchy fabric. Stretching the fabric as you sew will not produce a stretchy stitch, either. Instead, it will produce a puckered, messy stitch. Each machine is different, so refer to your sewing machine manual about adjusting tension. Practice on scrap fabric to familiarize yourself with its effects. The most common uses for a zigzag stitch are as a stretchy stitch and as a seam finish. Adjustments to stitch length and stitch width will change the appearance of a zigzag stitch, more so than adjusts to a straight stitch. When using the zigzag stitch, the width sets the swing of the needle, not the needle position as it does with the straight stitch. Adjusting the width of the zigzag stitch will affect how wide the stitch is. For a seam finish, the width of the zigzag stitch will affect how the fabric lays. It also ensures that you are catching enough fibers of the fabric to keep a stable seam finish. For a stretch stitch, you will need to use a narrow zigzag stitch. Small adjustments to increase the width from a straight stitch to a zigzag stitch will allow the stitching to stretch with the fabric while sewing a straight seam at the same time. Adjusting the length of a zigzag stitch can look like it is affecting the width as well, but it is not. Setting a short stitch length will produce a bar tack and a lengthened stitch length can make the zigzag stitch almost appear to be a straight stitch. With the zigzag stitch, it's very important to test on scraps of the fabric you will use for your project. It will help you see the finished appearance of the stitch and find the perfect combination of stitch width and stitch length for your needs. 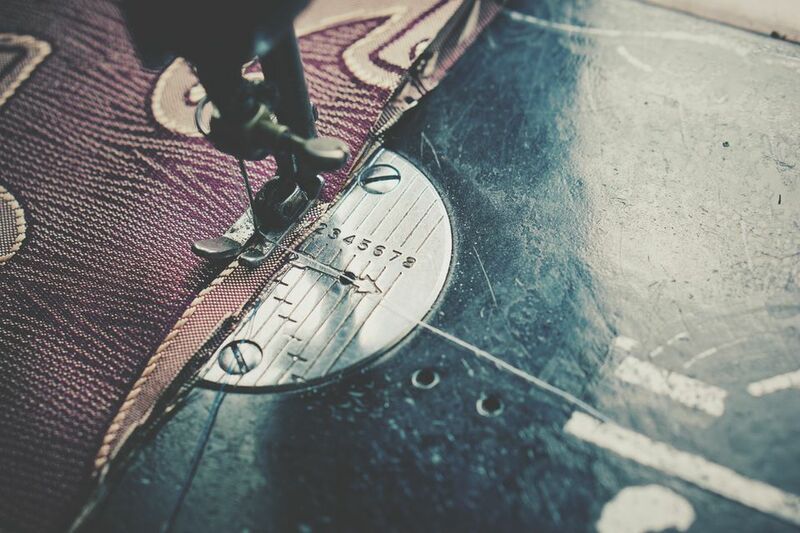 Testing also allows you to examine the stretch of the stitch. You'll want to stretch the fabric to see if the stitching actually stretches with the fabric or if the stitching breaks. If needed, make adjustments and test again before starting on your project. The best way to know about the adjustments that can be made on your particular sewing machine is to refer to the sewing machine manual. Experience is also key to understanding how adjustments affect the finished stitch. As you read through the various options available, practice on scraps of fabric and make samples. Also, keep in mind that different combinations work uniquely with various fabrics. With each new sewing project, you'll want to use scraps of the fabric you'll be using to determine which stitch is best. If you are new to sewing and have limited scraps available, there are many economical fabric sources. One of the easiest is to stop by your local fabric store and look for clearance or close-out fabrics, which are often discounted greatly.